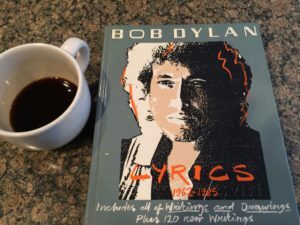 The first time I heard Bob Dylan’s song “Hurricane,” about the controversial murder conviction of black boxer Ruben Carter, I pulled my 1972 Chrysler New Yorker into a rest stop off the highway so that I could allow myself to be riveted. In my memory it is summer and I fumble for a pen not yet gummy and ruined by too many hot days in the car, and for a napkin in the hope I would be able to record the name and search for it at a record store. Times were different then. Google did not facilitate such searches. The story surfaces because it so closely tracks Emily Dickinson’s much-echoed remark to a friend named Higginson : “If I feel physically as if the top of my head were taken off, I know that is poetry.” And because this weekend, Bob Dylan was to be in Sweden, months after the Nobel Prize banquet, where members of the academy were to meet up with him before a previously arranged stop on his current concert tour. After the announcement that Dylan was being given the prize for 2016 that Faulkner got in 1949 and Camus was given in 1957, the boo birds came out in full voice. Writers from every part of the talent spectrum started responding in green ink, tweeting and posting on-line their disdain for the selection. Several took the easy cheap shot, asking haughtily if they could submit their fiction works for Emmy awards, or nonsense along those lines. As so often happens in the world where social media values immediacy over all else, the boo birds – while seductively snarky – are mistaking ignorance for wisdom. The first literature was sung. Here, I speak only for myself. Joanna Sterneck Gerlt on To the living. Peter on To the living. Chuck Carmone on To the living. This modest little blog is going to be about a lot of things. It will be about the big scary task of moving my my first novel, The Splendid Children, out into the world. But it will also be about the circuitous route that has me writing fiction in my 40s, and eventually the progress of my second novel, which may be titled Postmarked in Paris. Because I cannot help myself, it will also, from time to time, be about the sound of my daughter laughing, the way my heart dances a little when my wife smiles at me, maybe even my cat who snores and purrs at the same time. As a newspaper columnist, I took a lot of joy in finding the story and the magic in the clutter of everyday life. I’ll try to do a little of that here. Poke through the posts as they trickle in. Comment and tell me where I’m right and wrong. Share what you like, and if you write too, tell me where to find it. The world works better when we know each other.